Indonesia have a lot of place to visit. Especially for holiday with natural view. Green Canyon is a tourist destination object in West Java, Indonesia, precisely in the town of Ciamis in East Priangan area, west of Pangandaran approximately 30 km. Pangandaran Green Canyon famous name after one of his American tourists gave the name to remember the beauty of nature in the Grand Canyon of Colorado, USA. What a view and excitement experience in there? You will know Pangandaran Grand Canyon, Underground river to the sea. Just check out the video below. Green Canyon is a sort of underground river that can be accessed from the sea, the panorama of interest is the relief on the river wall and the clear river water. 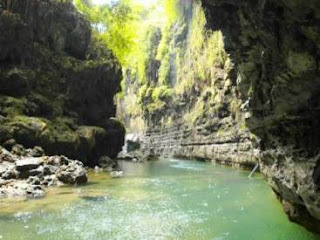 We can get into the Green Canyon by boat (usually a lease: there is a terminal in Cijulang). Lifetime may not be forgotten when you go to Green Canyon. Do not forget to bring your friends ..! Local people call it “cukang taneuh” refers to the bridge from the ground … This means that over the river is the land that can be passed person. Cukang Taneuh or Green Canyon is one of tourism object in West Java which is located in the Village District Kertayasa Cijulang, Ciamis Regency ± 31 km from Pangandaran. This tourist attraction is the river flow through the cave Cijulang with stunning stalactites and stalaknit and flanked by two hills with rocks and trees provide natural attractions are unique and challenging. At the mouth of the cave there are waterfalls Palatar so the atmosphere at this tourist attraction was so cool. Activities that can be done such as rock climbing, swimming, boating while fishing. To reach this location visitors can use a lot of boats are available at Pier Ciseureuh, both outboard boat or canoe paddles. This tourist attraction as a tourist attraction adjacent degan Batukaras and Nusawiru Airport (ref: wikipedia). Extraordinary beauty of the natural process of erosion generated by water in the soil on rocky limestone stalactite and stalagmite and reliefs on the river wall. And calm waters flowing gently challenges us to swim and bathe and very refreshing. Green Canyon can be accessed from Bandung for approximately five hours of good road trip and wide enough. On holidays usually a lot of local tourists who visit and enjoy the natural beauty there. Part of somewhat famous on the inside (underground river) of Green Canyon is Umbrella Stone, a rock that resembles an umbrella with a height of about 3.5 meters formed by natural phenomena for many years. Usually the visitors will climb the rock and jumped into the water and swimming.